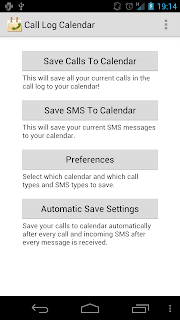 Call Log Calendar saves calls and SMS as calendar events to your android device's calendar (which can be synced with Google Calendar). Click here to check out our FAQ page. New event name format: "Contact Name (phone number)"
Would be nice to have the Call direction in calendar. 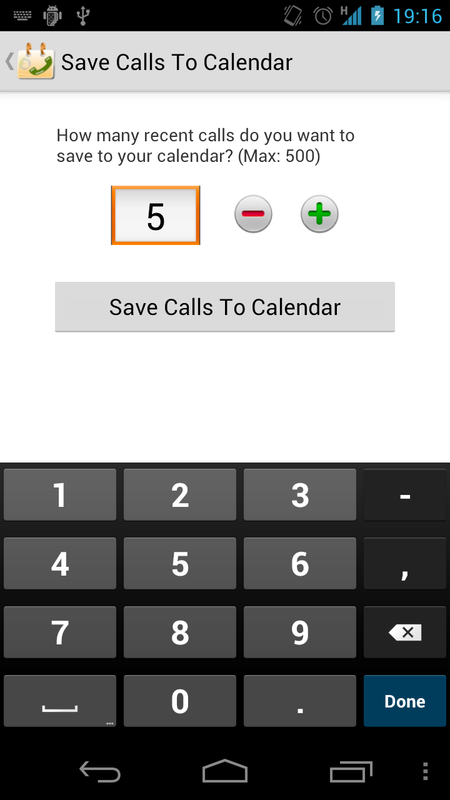 Or maybe it would be possible to set diferent calendars for incomming, outgoing and missed calls? Are there any palns todo the same for SMS? 1. 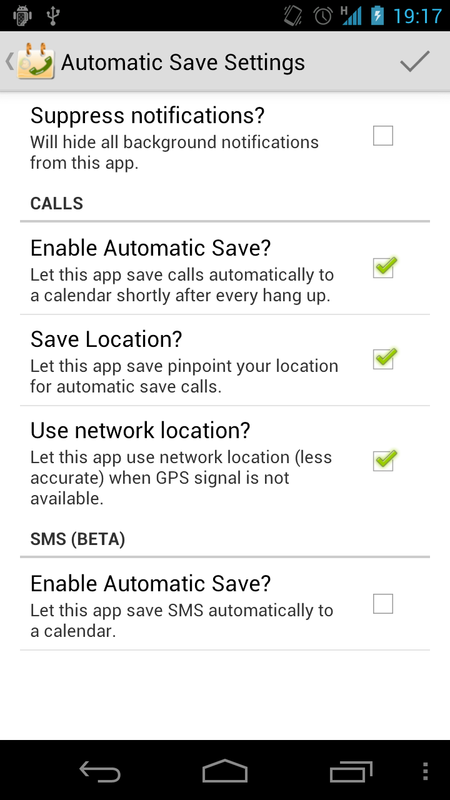 Automatic save outgoing sms not only incoming. 2. 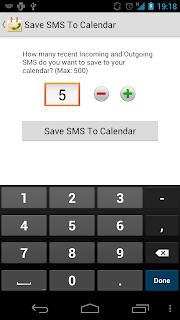 Save more than 500 sms (I have more than 1000 in my phone). Excellent program - I used an older version 1.2 on GalaxyS 2.1. But yesterday when I updated GalaxyS to 2.2. - Stopped working. Hi i tried a lot of times to buy Call Log Calendar but Google Checkout said to me that my visa does not accept ¥, only $ and €. It's frustrating. How i can buy your application? Really cool app! I have one feature request: The location is saved as GPS coordinated in the appointment. It would be very good if there is a link to Google Maps in the appointment where I can click on to see the location. I love the app, but I recently upgraded to Gingerbread on my rooted Droid, and the program has stopped working. It does not log automatically, nor if I tell it to log manually. Nothing is added to the calendar. Is there anything I can do to help you debug this? Thanks in advance! Hello! Thank you all for the input! I'm aggregating all requests and I will be implementing some of them. The names do not show up for me despite the relevant option being selected in the settings. Any ideas? Desire GSM running CM7. 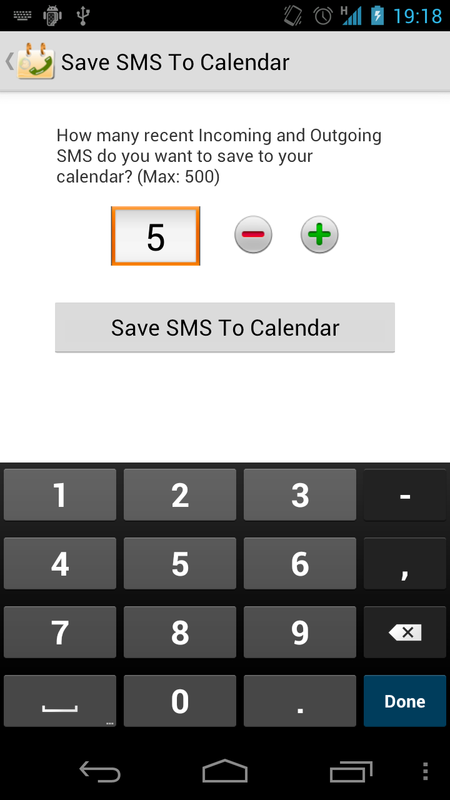 Do you schedule to add MMS export to calendar ? Hey, I love your app and have been using it for a long time. 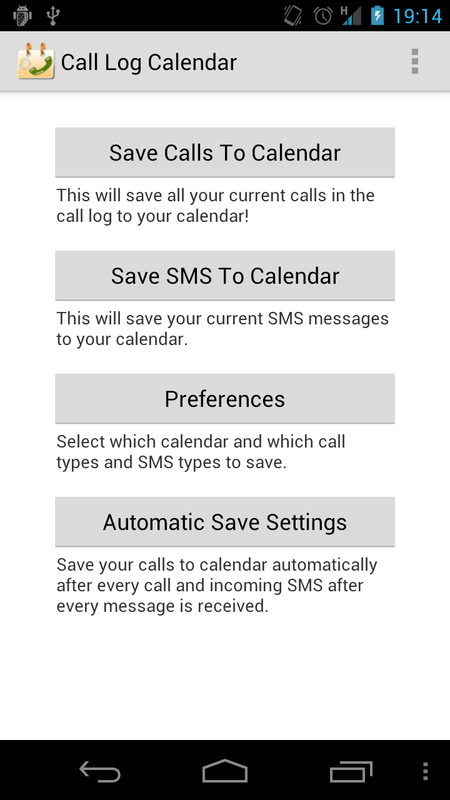 I have found that it doesn't save SMS automatically to the calendar though. I was wondering if an integration with tasker would be possible so we could automate the SMS backup as an option within that app. Great app though, love it to bits. I do read all the comments and some of the issues are being addressed. Regarding the issue with Exchange calendars, there is still no solution found for it. Some servers work, others don't: the one server I have access to happens to work alright. If anyone (specially system administrators) can help debugging this issue, it would be very helpful: contact me at android@joao.jp . Can you record the call to show the vendor that there are quality issues? No, It's not possible to record the call as there's no permission to get the audio. Bought the App, really want to use it, but it's only saving things locally to my phone. The events it creates and are in my calendar won't sync with my corporate calendar for some reason. I made sure I have the proper default calendar selected, and that there are no security settings preventing it from syncronizing. It doesn't make a lot of sense, if it's in my corporate calendar on my phone, why wouldn't it sync? If I put in an event manually, I see it on my Outlook calendar immediately. None of these will show up there though. Ideas? This App is really useful. SMS is functioning normally. However, the MMS are stored BY call records. 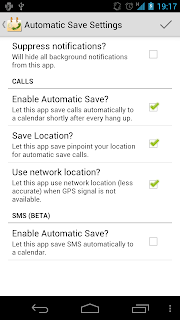 Regardless of SMS SAVE SETTING, MMS is stored as a record of the call. If you resolve this bug, this app really would be perfect. Very nice app. but maybe is possible to add dual sim functionality? Great app so far, nice job! Super application. I have used it for well over a year without a hiccup. 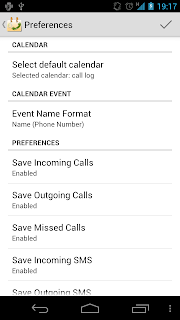 One suggestion for a new feature is the ability to make a note regarding calls before they are posted to the calendar. Aside from the obvious benefit it would also help to sort calls noted on the calendar that come from trunked systems (where everyone at the location dials out on the same number). Super app. It is working well on my Samsung Note 2 running 4.3. There was a bug in the last version (2.0.0) that prevented the app from upgrading. A new update (2.0.1) to fix this issue is already available at the Play Store. A reinstall may be required in case you had uninstall and install the app again. I recently updated Call Log Calendar on an Android Device running Microsoft Office Exchange. Since the update the calls are located to the selected Microsoft Exchange account calendar on the mobile device, but those calendar entries do not sync back to exchange. If I manually enter an item on the mobile device or desk top, those items do sync. 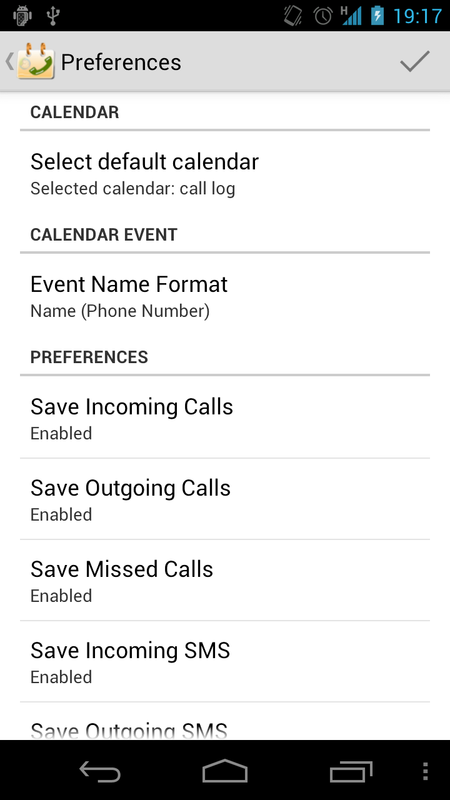 It is only the call log entries into the Calendar on the mobile device that do not sync. The previous version worked perfectly, but since updating mid day on Saturday Jan 4, no call entries sync back to exchange. Please advise? Is there a fix? If not is it possible to roll back to the previous version which was functioning properly? Are the superuser permisions required to automaticaly save the callrecords to callendar? После обновления проявился небольшой баг: при получении отчета о доставке программа повторно записывает в календарь отправленное смс, получается их в календаре два одинаковых. Hi, just bought the paid version since the free version seemed to work and synced ok to my exchange (office365) server. I set up a new Exchange calendar to sync to. However now the syncing is not working. It fails when I try to force it in the "Accounts" preferences. So I removed the Exchange account on Android then added it again - this time it synced ok. Then I added all the calls to the calendar again, and now it has stopped syncing. What it looks like is that somehow the entries created by CLC are incompatible with the Exchange server? Perhaps length or number of new entries or something else? I increased the number of items to sync to 300... maybe that's related. I'll report more as I test more. I would love to isolate the issue as this is SUCH a useful app. If you can offer any other suggestions or fix the bug I'd love to hear about it. Can you please allow saving of more than 500 calls and sms? I am happy to pay for the app, but I need to be able to save more than 500. On my Oneplus2 Oxygen 3.0.0 I gave the right permission, but the app saves only the calls, the SMS -s don't saves automatic, only manual! How can I solve this bug? Please help me, I have the paid version! Love it. But noticed that Google voice/hangout calls are not being logged - can this be added ? Its a fantastic app. I have buyed the app, but now i can't find it on the play store. What happened? I about snapped my phone in half and got a junky iPhone because this app isn't in the play store that I could find. Lucky I found an apk, but I worry it will be gone. The only app that does something similar to this is backup+. This app blows everything out of the water. Find this developer and tell him to put it back in the play store.